Why is LTAD Not Universally Embraced? Evidence is clear that youth that participate in a variety of sports have lower injury rates, more enjoyment, and perform better. Sports are often the hook that excites kids to be physically active. If they receive developmentally-appropriate, fun activities that involve them in the process, they are very likely to continue to be physically active. 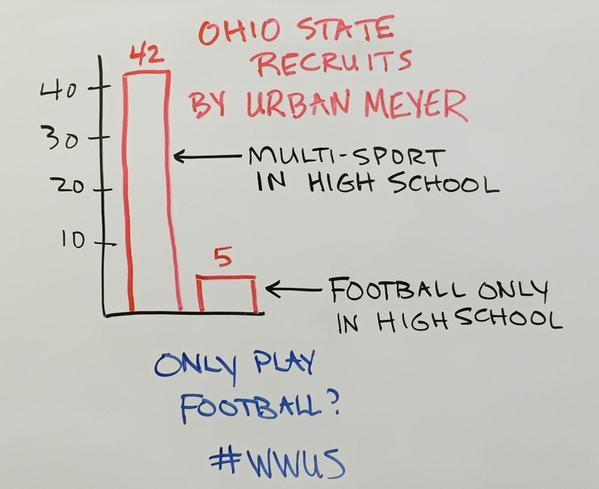 So, why isn’t every child involved in youth sports? The concept of long-term athletic development (LTAD) arose from the need to provide our kids a better opportunity to learn the sport skills and life skills to become productive members of sports teams and (in adulthood) work teams. Due to lack of coaching education requirements at all levels of youth sport, not every coach understands the concepts of positive youth development, pediatric exercise science, and pedagogy necessary to make youth sports a positive experience for every child. It is no wonder, therefore that nearly 70% of youth drop out of youth sport by age 13. The phrase long-term athletic development still confuses coaches, athletes, parents, and even professionals in the field! Each component of the term can be easily misinterpreted. Long-term should denote the entirety of childhood and adolescence, not this week or this season. The term athletic should produce images of each child performing to the best of his/her abilities within their personal developmental phase, not compared to all other kids or at only one point in time. Development should focus on the holistic growth and potential of every participant’s physical, social, and psychological well-being, not just their physical performance in a specific sport or contest. To address the need for widespread adoption of LTAD concepts, two harmonious models have been developed. One model, the Composite Youth Development Model http://journals.lww.com/nsca-jscr/Abstract/2015/05000/Long_Term_Athletic_Development__Part_1___A_Pathway.36.aspx integrates the physical and psychosocial needs of youth from the strength and conditioning context. The other, the American Development Model http://www.teamusa.org/About-the-USOC/Athlete-Development/Coaching-Education/American-Development-Model highlights the principles and stages of youth development through sport. Together, the two models create a holistic experience for all kids to successfully participate in sport and strength and conditioning programs. Together, we can fill the talent pool with kids who love sports and physical activity, coaches that understand how to positively engage kids to be lifelong movers, parents who rally behind their kids’ positive youth development, and we might even educate the professional naysayers who fail to recognize the value of sports and strength and conditioning for all kids.